Location : Tabačka Kulturfabrik, KOŠICE. Sunday’s musicians (Muzykanci) – Kazimierz Karabasz (PL) – 1960 – 9 min. A film about a single rehearsal of an amateur brass band made up of Warsaw tram drivers. Awards: Leipzig IFDAF 1960 – Grand Prix, Syrenka Warszawska (Warsaw Mermaid) 1960 – award for best short film of the Film Critics Club of the Association of Polish Journalists, Tours ISFF 1960 – Special Prize, Venice IFSDF 1960 – St. Mark’s Gold Lion, Krakow ISFF 1961 – Golden Dragon, Mexico City ISFF 1961 – Special Prize, Oberhausen ISFF 1961 – Grand Prize, San Francisco IFF 1961 – Golden Gate Award in the category of documentary film. Bread day (хлебный день) – Sergueï Dvortsevoy (RU) – 1998 – 54 min. 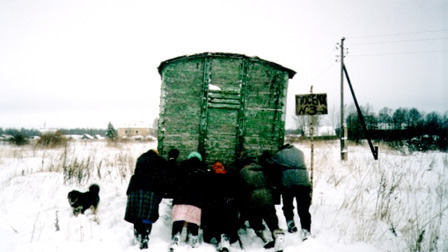 “Bread Day” unflinchingly depicts a community of pensioners living in near isolation outside of St. Petersberg as it enacts the weekly ritual of bringing a delivery of bread—left at a rail junction two hours away—into the village for distribution. Dvortsevoy documents the struggle as the elderly residents complete their arduous task and then gather in the store, where portions are unsatisfactory and interactions grow heated. Attentive as much to the people as to the landscape and the animals that share it, Dvortsevoy captures village goats and a litter of puppies along with the bleakness of rural poverty and old. More infos in English : here.